and creator at The Everyday Home. for living a simple life. Thank you to Pamela for having me as her guest. 1) What is my decorating style? the years, and one day I hope to figure out an exact name for it. English Country and a love of Charles Faudre? You get The Everyday Home. I have always said I need at least 5 homes, one for every style I love. word sounded so raw and uncertain. My favorite room is definitely our Kitchen. a large agriculture farm in NC. moved in. All DIY projects. You can take the tour of my home HERE. 2) How did you find your style? My style has been greatly influenced by our travels. blessed to enjoy 3-years abroad in Europe. more than anywhere we have ever lived. had stockpiled, and then he turned it into a literal work of art. during my travels thru England. 3 - What has been your most treasured find of your home? an unknown storage center and then shipped all over the world. and discovered a group of manila envelopes. assorted baby pics and travel pics which I thought I had lost. have made in my home in a long time. 4- What tips do I have for creating a beautiful home? This is a tough one for me, actually. I could give you the boxed answer like "let your style grow organically"
and "utilize magazines and blogs, etc, to help you discover your style." with someone else's style is that it is never quite your own. everyone else collecting - particularly trendy things. feathers in black polka-dot vases, then by golly go for it. offer creativity at all levels and share the best of what we offer. My style has evolved over the last 30 years. I look back at pictures 15-20 years ago and cringe. Don't be afraid to let your home evolve as your life does. your family. Not someone else's home. Thank you again for letting me share this with you. Most of all - I wish you blessings. Thank you Barb for sharing pieces of your home with us today! It is always fun to look back thru the years and see how our homes have changed. You have turned your into a stunner! Love this home!!! Definitely click the link to take the home tour. Full of beautiful treasures and ideas! Thanks for sharing such a lovely place! Oh I so enjoyed Barb's words of wisdom and the pics of her gorgeous home. I love her style, it's updated and trendy, but very unique and "her." I am going to give her a visit now too. I love this featured share, Pamela. I hate to ever miss it, one of my fav reads. Thank you for sharing Barb with us today!! I so look forward to this feature every Sunday morning with my coffee. Today I was not disappointed. Luv Barb's style. Her collected look speaks to me. Always stunning. Thanks ladies. What a great feature! It's great advice, "Just collect what you love". That approach is working well for me. I had a moment when I read that you found your baby pictures. How wonderful! Wow a treat to get a glimpse inside. I will be hopping over for another look. Thank you for sharing. Thanks, Pamela! 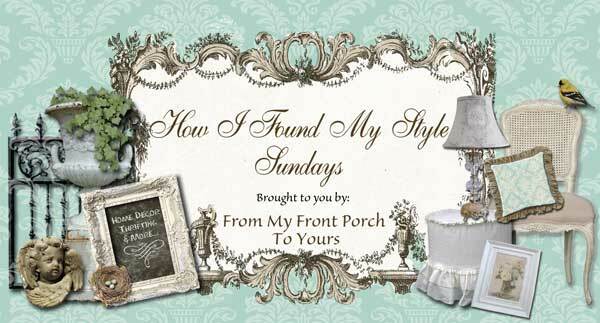 I love Barb's no nonsense approach to decorating and her thoughts on finding your own style. I have to check out her blog...her home is beautiful! Barb was a great choice to feature. Love her home. So gorgeous. That antique bed made into a bench WOW! Love that piece. Simply beautiful. Barb, you are SO right about not trying to make someone else's style your own. I did that as a young woman and ended up regretting it. I LOVE the choices I have made for our home now. This was a great post. I, too, have wondered about how some bloggers always have PERFECT rooms etc. Now I realize, nothing is perfect. What a beautiful home, every room is just gorgous .Oh my, choosing a bed from the dozens of vintage beds and having him turn them in to art, how special that would bet? Barb's bench is just stunning! Great tour. thank you! 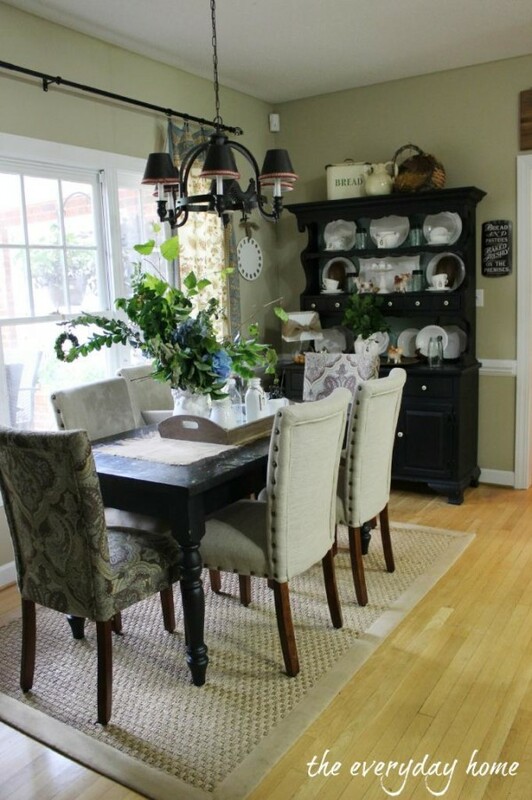 Love Barb's style and beautiful home...great feature Pamela!! Love the story about finding the photos. How wonderful! I remember seeing the bench on your blog a while back and love it! Bless you for being a great military family! Hannah, I love your kitchen. Especially the blue painted brink and server hanging on the wall -- a girl after my own heart.